The Independence is a 34′ Tiara and is 12′ wide at the stern. 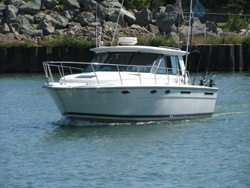 She was built, designed, & outfitted specifically for salmon & trout fishing on the Great Lakes. The Tiara brand is widely recognized as one of the highest quality makes of vessel in the world. She is powered by twin, 350 fuel-injected Crusader engines that have the ability to get us offshore faster than most charter boats and can accomplish that at a more optimal fuel consumption rate, relative to other vessels. These latter features should enter your considerations when choosing a charter boat in regards to where we often need to go to catch fish and what that costs a captain for fuel for other, larger boats. The Independence has a clean, private bathroom and large cabin to stow personal items. And most importantly, loads of fishing room on the stern deck to run a full spread of lines and battle fish. 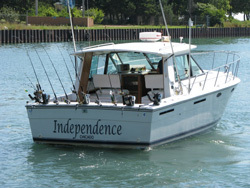 The Independence also undergoes constant technological and cosmetic upgrades every season to keep her streamlined, sharp, modern, and safe. Captain Rick takes a lot of pride in running and maintaining up-to-date, top-of-the-line gear – Penn International 975, Shimano Tekota reels, high-speed Daiwa Saltist reels/Shimano Talora rods – Captain Rick continuously invests in the best, highest quality, well-maintained reels & rods you will find on any charter boat on Lake Michigan. New for the 2017 Season were two, 9″ Garmin flat panel screens which interface with new, cutting edge fishfinding technology; CHIRP sonar/fishfinder, Garmin Fantom radar, plotter and GPS. As well as all new high speed, Magnum Metalz downriggers; by far the most advanced, fastest, and reliable downriggers available today to get us down deep, fast! Captain Rick runs Penn 975 for the for the downrigger spread and new, high-speed retrieve Daiwa Saltist reels for our ALL of our longline leadcore, copper line, deep diver and ultra-deep downrigger applications. Like the Penn 975’s, the Daiwa Saltist reels are the best reels available for running longline outfits because they allow you, the angler, to reel fish in faster from longer distances. Shimano Tekota 500 and 600 round out the remaining gear setups and are highly regarded for in their own right. All of our longline, deep-divcer and ultra-deep downrigger reels were upgraded to high-speed, Daiwa Saltists for the 2014 and 2017 Seasons. 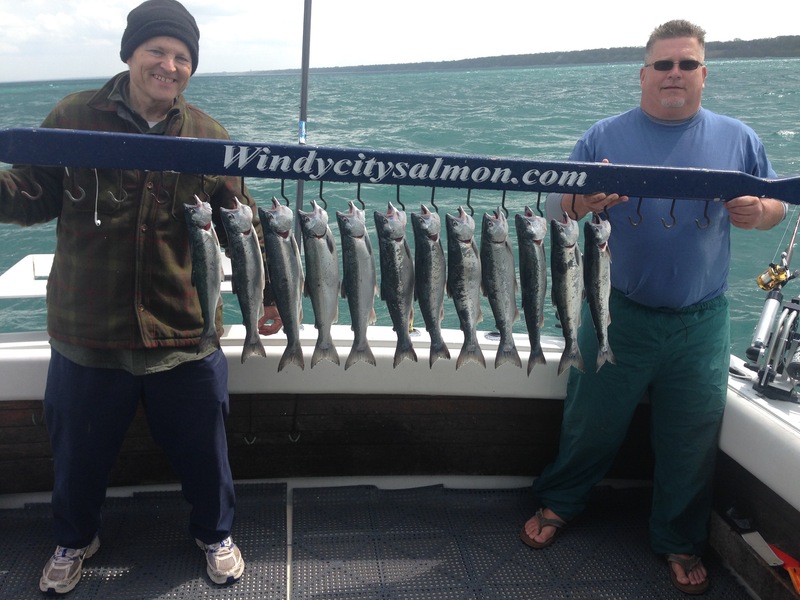 Fresh line is wound on all the reels every season and each rod and reel are wiped down and cleaned. As well as each reel taken apart, moving gears and parts examined for replacement, re-lubricated and re-oiled. Seven-foot, light-action Shimano Talora comprise the primary rod selections across most of the spread. Other Talora lengths and models are used for different applications as well. In all of these regards, Captain Rick is not officially partnered with or supplied by any sponsor, dealer, manufacturer. Captain Rick feels that up to date, high-quality gear and technology is an important part of his and your fishing experience. He reinvests funds from the business into these purchases. Captain Rick encourages you to ask other charter services that you might be considering, what improvements, upgrades, and investments they have made in their operations in the last three years.